I haven't had a chance to cook much lately, but with a long weekend before me, I finally had the chance to get into the kitchen and play around with a few recipes. After a whole day of baking, I wanted to make something quick and easy for dinner, and this recipe instantly came to mind. This is a really simple, no-fuss Chinese dish that I actually learned from my aunt. The name itself says it all—the numbers tell you the proportions you need for the short list of ingredients. One tablespoon cooking wine. Two tablespoons soy sauce. Three tablespoons sugar. And four tablespoons vinegar. Throw it all in a pan and simmer for about 45 minutes until the ribs are lacquered in the sauce and voila! Dinner is served! While the spareribs cook, make some steamed rice and stir-fry or steam some Chinese greens—they are the perfect accompaniment to these spareribs. 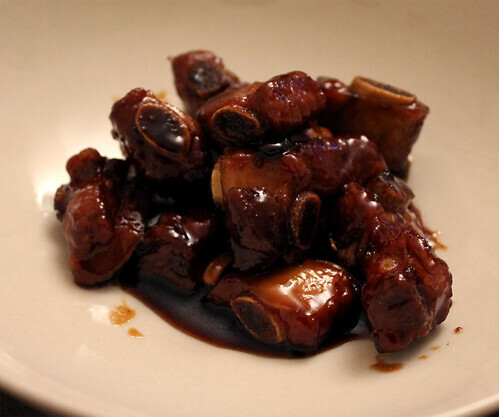 Cut spareribs into smaller pieces. Rinse and pat dry. Add all the ingredients into a medium pan or pot and bring to a boil. Turn down the heat to a slow simmer over medium-low heat. 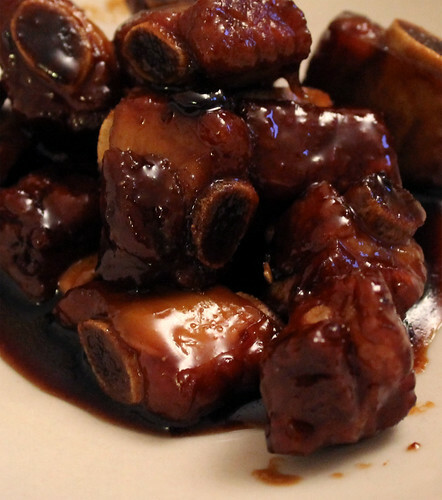 Cook for about 45 minutes, or until the spareribs are a deep reddish-brown and well coated. Serve immediately.